Can we just like each other? “Why do you find it so hard to like me?” That seems to be a common question in our society. Bookstore shelves are full of self-help books trying to answer this question. We seem to think that happiness in our horizontal relationships, not our vertical relationship, is the key to inner satisfaction. But we don’t stop to consider that we are fallible beings. Why do we always have our expectations too high? We tend to walk through relationship after relationship automatically setting ourselves up for failure. So, why? Why do some people like me…and others don’t? Do you not like me because of something I did…or who I am? *I am married to your dad/mom (the step syndrome! )…or your ex (the jealous syndrome)? Do I not like you for the same reasons?? Isn’t it about time we all get over ourselves??? Everyone is consumed with their own little world. Most people go through life worried about the thoughts others have toward them, when in reality, others are only consumed with themselves and don’t even give a thought to anyone else. At 20 we’re only concerned with what others think of us. At 40 we really don’t care what others think of us. At 60 we realize nobody really thinks of us. 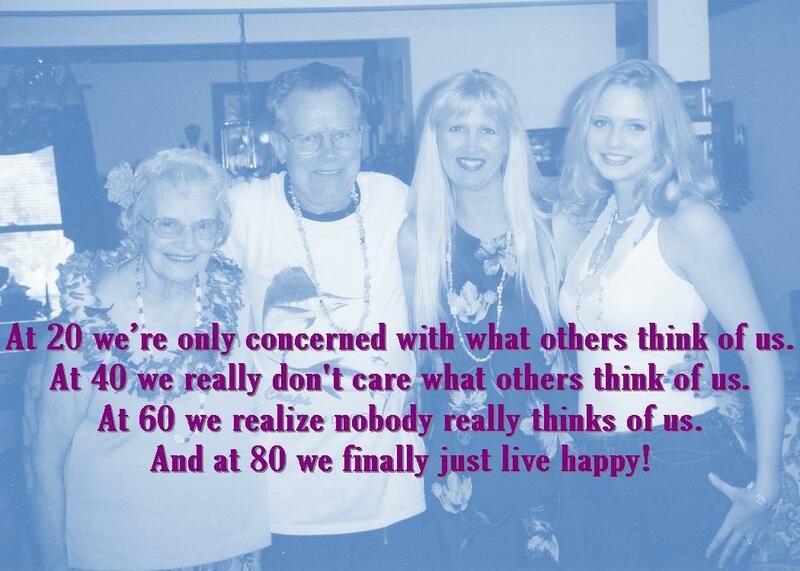 And at 80 we finally just live happy! In God’s amazing design, everyone is different. We all have varying personalities, backgrounds, belief systems, and social economic status. I’ve read that 10% of people in your life will not like you no matter what you do. Some personalities will naturally clash. The trick is to overcome our individual preferences and develop an attitude of acceptance. But then, we can’t be offended over every little thing. Attitudes of acceptance requires self-acceptance. We need to be secure in who we are as well. Do we even like ourselves? Knowing that God loves us and accepts our person-hood should alleviate any angst for the opinions of others. Then we are free to accept others as they are…as God accepts us…the way Jesus accepted the woman at the well, the centurion, and the ragamuffin disciples. So…can we just like each other? But just maybe…with God’s Spirit flowing through us…maybe we can learn to actually love each other? Maybe?? This entry was posted in Forgiveness & Justice & Love, Grace in My Journey, My Testimony and tagged Blended Families, character, Christianity, family, friends, God, inspiration, love, people pleasers, Relationships, step-parent. Bookmark the permalink. Thank you for reminder. At 36, I already realized everyone is actually very busy with their lives. And the problem seem to lie in us seeking approval on the outside. The differences are meant for us to grow, learn lessons and discern. That’s why I love that saying…it’s funny but oh so true! Blessings! !